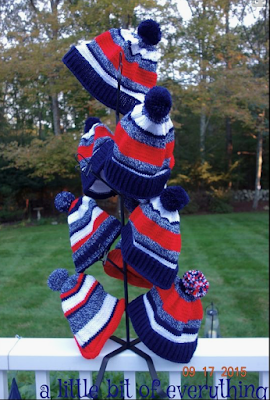 Needlework: Hats, Hats and More Red, White & Blue Hats! Go Pats! With football season upon us, I thought I would knit up some hats in the colors of our family's favorite team - The New England Patriots! This free Lionbrand pattern is very easy and works up quickly so it did not take long to make hats for the entire family. size 7 needle and 79 sts. for a child size and 90 sts for an adult size. You can view the rolled bottom version of this hat here. And here are a few more hat variations. Such fun hats! You're so crafty! Your hats look great. You have enough for a team! I love all your red, white and blue hats - so patriotic! The hats are so fun and your family is going to love them! Thanks for sharing with SYC. Great hats! Thank for joining Home Sweet Home! Those are some great looking hats!! You're so crafty and talented! I love those hats. They look really great! Thanks for sharing!